When Paragon Architects was appointed in 2013 to design the new corporate office for Sasol, the multinational petrochemical organisation’s structure and logo were used as the departure point for the conceptual design of the building. Best described as a “central sphere denoting stability, while the six rotating ‘business units’ suggest a force greater than the sum of its parts – strength through synergy”, the Sasol logo encapsulates a set of shared company values. Paragon studied this distilled essence closely and the building form evolved into something serpentine, generating an interconnected space. The major challenge was to ensure that a large building of 68 000m² could be put up on the site, which is on a curving edge of Katherine Street, and be well connected both vertically and horizontally. The building, which can accommodate up to 7 500 people, has ten storeys above ground and seven basement levels. A central core of circulation and services ties the building together with a series of bridges linking the different areas occupied by the business units. It was important for Paragon Architects to push boundaries in the design, which features external light volumes and two dramatic skylights articulated with acoustic baffles. The striking glass facades were carefully engineered by Pure Consulting and Paul Carew from PJC Consulting to ensure that the five-star Green Star design satisfied performance and aesthetic requirements. The glazing on the external facade comprises floor-to-floor unitised double-glazed panels, combining reflective glass spandrels and vision glass. The shapes and glass variations are encapsulated in each panel, which led to over 2 000 panels being designed. The vision glass is a reflective performance glass, AGC Stopray Vision 36T, which has a high light transmission level and maximises visibility out of the building whilst maintaining a high comfort level inside. The reflective spandrels consist of a bespoke textured glazed unit, Safety Shield Imagin Krizet with Ipasol chrome coating, fired at 680° with a silver backing, insulation and an aluminium panel. This glass has not been used in South Africa before and this project exploited not only design but also materiality. In addition to the glass performance reducing energy consumption and maximising user comfort levels, the building volumes have impacted on the design. Where sections of the building cast shadows on itself, the size of the spandrels reduces to allow more light. 1. To provide the building with a base and perimeter that are almost entirely a greened zone. 2. To provide a landscape that is as fluid and interactive as the architecture it supports. 3. To create gardens and spaces that are aligned with the patterns of nature, encourage biodiversity, and allow for the preservation of a delicate balance and understanding that hangs between man and the environment. These notions translate into flowing lines that are introduced as one approaches the entrance from the street into a space that bridges two expansive reflection pools, and welcomes employees and visitors into the sculptural volume that is the Sasol headquarters. The integration of the outdoors and the indoors is clear as the reflection pools continue their bow into the main atrium and pockets of forest filter the element of greening in from outside. Winding pathways lead the visitor out onto the serene Podium Level landscape, where art pieces and sculptural elements can be observed, and through the rich vegetation displays that showcase carefully selected indigenous trees and shrubs that are specifically known for their bird and butterfly attracting characters. Moving around the building, varying planted indigenous biomes comprised differing landscapes: Wetlands, grasslands, forests and savannah areas. Planter walls rise and fall organically, transforming in places to become seating elements and creating sculptural spaces that open up to the sky and that, with the aid of integrated lighting designs, come to life at night. Inside, Paragon Interface also took inspiration from the various Sasol business units surrounding the nucleus. The contemporary workplace design allows for free movement both vertically and horizontally throughout the building via destination-control lifts and bridges, which are stabilised by a spectacular steel tubing fork. The concept of open, transparent and remote work spaces is extended to embody the mores of Sasol to include interactive facilities such as restaurants, canteens, art galleries and coffee shops. 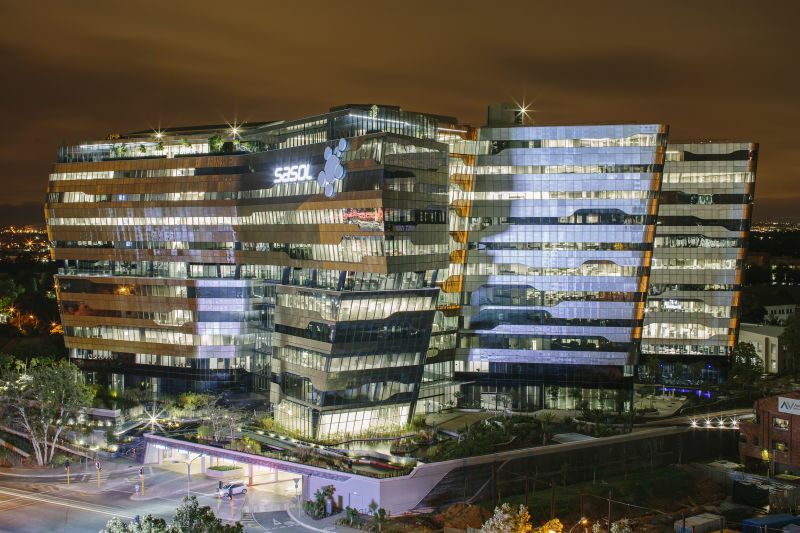 Completed in November last year, this striking glass building now houses the operations and staff from 14 previously occupied buildings across Johannesburg, and succeeds in unifying the Sasol corporate culture. Full thanks and acknowledgement are given to Paragon Architects and Paragon Interface for the information given to write this article. Developer: Alchemy Properties – Greg Sacks, Arthur Davies. Architects: Paragon Architects – Anthony Orelowitz, Tershia Habbitts, Jose Ferreira. Interiors: Paragon Interface – Claire D’Adorante, Dale Friedman, Kirsty Schoombie. Structural engineers: Sotiralis Consulting – Andries Denner, Stephan Bothe. Mechanical: Adaptive Resources – Carel Schaap. Fire: TWCE – Trevor Williams; Andre Steyn – Zach Masinga, Jaco Prinsloo. Electrical: Quad Africa – Roger De Souza, Jacques Moolman. Plumbing: Izazi – Trinesh Chaka. Quantity surveyor: Pentad – Frans de Jager, Gillian Healey. Landscape: Insite – Ferdie Häefele Neal Schoof, Karen James. Green consultants: PJC – Paul Carew, Alison Channing. Project managers: Capex Projects – Stuart Walls, Peter Laurence. Facade engineers: Pure Consulting – Sean Couzyn, Warren Wessen. Safety officer: Cairnmead, Chris Lourens. Construction: Aveng Grinaker LTA – Reon Govender, Vincent Wiggins, Richard Amm. Sasol’s new corporate head office can accommodate up to 7 500 people, has ten storeys above ground and seven basement levels.